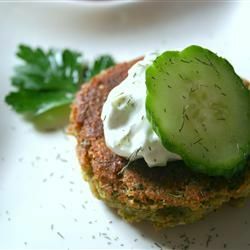 Falafel with yogurt sauce - click the picture to pin! My favorite New York City street food was falafel, but I've never tried to make it. Recently I decided to whip some up from scratch. The pin here is NOT the recipe I used for the falafel itself - that one is lost to time and space, and it's a good thing because it didn't work. It called for a can of mashed chickpeas and some spices, mixed up and made into patties. Well, friends, mashed up chickpeas do not make patties - they just fall apart. So I improvised, and added an egg, and some flour, and got some patties and fried them up and they were fine. I think next time I will try this falafel recipe. We had falafel in pita sandwiches with lettuce, tomato, and red onion. I'll try it again, but this time with plain yogurt!